Hi guys! Sorry for not posting on Tuesday; my spring break has been surprisingly busy. But without further ado, here's a post by my friend Victoria! Science-Fiction is a very popular genre. Well-known science-fiction includes Jurassic Park, Star Wars, and Star Trek. The genre revolves primarily around superior technology. This can be futuristic technology, alien technology, modern-day-hidden-by-the-government technology. Basically, advanced science hence the genre’s name. This genre has been around for over a hundred years since man started dreaming about what the mysterious future would be. People such as Jules Verne or these French artists from 1899 fantasized about spaceships, underwater cities, and simplified farming devices. This is all science fiction, dreams of superior technology. What’s even more fascinating is that a lot of science-fiction has become reality. Communicators in Star Trek highly resemble flip-phones. Also Star Trek used memory drives resembling floppy discs decades before they were ever invented. With that in mind, let’s talk about some details. 1. Subgenres – Science-fiction has spawned many smaller genres. These narrow down the focus of what kind of science-fiction the story is. It can be very heavy like in Star Wars where there is no involvement of earth at all or lighter like in Back to the Future where Doc Brown invents a time machine in the 1980s. Apocalyptic: The apocalypse in an event that ends the world as we know it. For a genre, this is a story taking place during a world-ending event. In The 5th Wave, the Others aka aliens from another planet are ending the world. They’re creating a mass genocide of the human population with their superior tech. The main character, Cassie, watches this all happen and is one of the few survivors during the process. Post-Apocalyptic: A post-apocalyptic genre story is set after a world-ending event has occurred, so the world has already changed instead of watching it happen like in an apocalyptic novel. In The Maze Runner series, the Flare, a deadly disease caused by solar flares, has devastated the planet, rendering most of it a barren wasteland. This has in turn caused most of the big events in the series. Dystopian: Dystopians are often set in the future. A dystopian is an oppressed society usually by a totalitarian government. In The Hunger Games, Panem is ruled by the greedy Capitol who controls the districts, forcing them to labor for their pleasures and participate in the annual yearly pageant where children are forced to fight in a gladiatorial celebration. Space Opera: A space opera is a genre that happens primarily in outer space and distant planets. These usually involve aliens, though not always like in Firefly. In Star Wars, the films take place nowhere near earth at all, while Star Trek takes place on both earth and in space. Time Travel: This is pretty self-explanatory, but this is a genre that involves traveling through time, creating paradoxes, changing the past or future, having to fix an event, etc. Time travel can be a superpower like in The Time Traveler’s Wife or done in a time machine like in the TARDIS in Doctor Who. 2. The Setting – Science fiction is so diverse. Your setting can be earth, space, a distant planet, wherever you want. It can be in the future, the present, or the past. 3. The Characters – Your characters are very dependent on the setting. They can be used to their science-fiction world or they can be brought into a world of science-fiction. How does the world affect who they are? Do they own advanced technology like Han Solo’s Millennium Falcon? Do they have new slang like “shiny” or “gorram” in Firefly? Have the politics affected them like the oppression of cyborgs in Cinder? Do you have aliens or different races like Wookees and Droids? How does their culture differ from ours like how Vulcans suppress their emotions? What do they look like? Are they green like Yoda? Do they speak a different language like Klingons? 4. The Technology – This where it gets fun. I personally love coming up with crazy inventions like robots and weapons. Transportation, medical devices, and communication devices are other things to consider. Is travel faster? Have cures been found for diseases? Do they use holograms? Are there microchips? Do your research and see what technology is already out there. Maybe you can expand on it and make it more efficient or make something high-tech now common use in the future. How do I start researching for my novel? 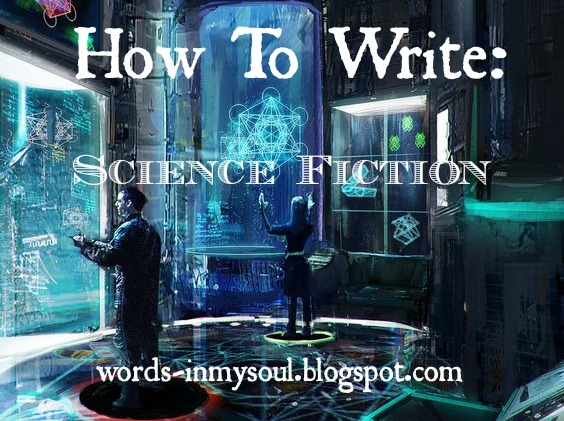 Science-fiction is a fun and diverse genre and host to many amazing stories. Try adding yours to the shelf! Thanks for reading! Have you ever written a science-fiction novel? Have you ever read/watched any science-fiction? Do you have a favorite science-fiction novel, show, or movie? Who is your favorite science-fiction character? Victoria Grace Howell is an award-winning, aspiring writer of speculative fiction. In 2014 she won the Teen Writer of the Year Award at the Florida Christian Writers conference and in 2015 she won the Beyond the Steeple Award. In April 2016, she will be published in Splickety: Havok Magazine for her short story. She also edits for the Christian site Geeks Under Grace. When not writing she enjoys drawing her characters, blogging, learning Kung Fu, cosplaying, and a really good hot cup of tea. Be sure to check out her Facebook, Twitter, Pinterest, and blog.